It’s didn’t smell bad the afternoon I stopped by the plant last week. 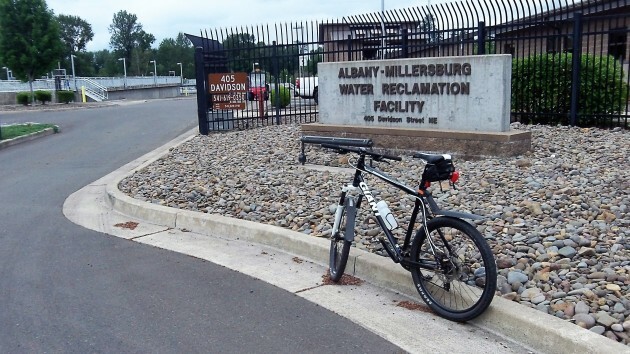 Residents downwind from the Albany-Millersburg Water Reclamation Facility — you can call it the Albany sewage treatment plant if you want — apparently will have to put up with the continued failure of one aspect of the $70 million plant for quite another while. The problem is that a system to reduce the amount of solid residue from the treatment process has not worked as intended since the expanded plant was finished in 2009. This has forced the operation to store the material and periodically send it off to the Coffin Butte landfill, with the unfortunate side effect that the plant, at times, gives off more of a stink than you might expect. Her email to me was prompted by a recent story on hh-today about the city council asking about an odor issue at the Coffin Butte composting center on Camp Adair Road. Her message: What about our problem? The bike route on my riverfront beat takes me past the treatment plant at least once a week, and I have not noticed the stink lately. Hart reports the problem occurs at night. When I talked to her last week, she said she had kept track and counted 12 nights since April 28 that the odor had been bad. In August 2012, the city of Albany achieved a settlement under which Siemens, the maker of the system at issue, would pay the city $4.75 million. After attorney fees, the city got about $4.4 million. Chris Bailey, the director of Public Works Operations, says that to date the city has spent $316,000 on “projects to define the preferred solids treatment process,” with some of that money coming from sewer rates. To finish the search for a solution, another $500,000 is budgeted in the fiscal year that starts July 1, 2016. Some $3,753,000.remains in reserve from the settlement, presumably to pay for whatever solution is agreed upon. So how long must the plant’s neighbors endure? All this the layman — meaning me — finds hard to understand. There are thousands of municipal sewage treatment plants all over the United States, and all of them deal with the disposal of solids. How do they manage, and why don’t we do what they do? for our plant. He demanded a solution–the offending chemical was identified and a process to transform it to one without the odor was implemented. Too bad gov’t employees pride themselves for not operating as businesses. If any councilperson or ranking city employee had to live in the smell it would be fixed. If the Council eliminated the big stink in town, then you’d be living elsewhere Tom. What has to happen is some kind of modification in the way the plant has to operate. That is not a trivial thing. And as Hasso states, the engineers are trying to figure out how it must be done. If it was easy, they would have done it already. Now I’m sure, Tom, that you’re prepared to show up with a roll of Duct Tape and a can of WD-40 and fix things lickity split. The Council has already received $4.4 million from Siemens. This settlement (if the city attorney did his job) includes damages and correction costs. So I’m not at all inclined to approve another increment of tax money to fix a problem which should already be paid for. Is there no end to the Council’s desire for additional tax money? Tony, you don’t really think our City Attorney gets involved with anything where he would actually have to face off against another attorney, do you? The function of this “City Attorney” is to create verbiage that turns a TAX (to us mere mortals) to a FEE, ASSESSMENT or whatever terminology used, so WE CAN’T VOTE on it. Guess you don’t know the Albany city attorney at all. “Facing off” against another lawyer is among the things he does very well. So if is funded by sewer fees and a settlement why is it not fixed. Here is why–hire a consultant and wait. Just like the doors at the post office. Back in 2014 Hasso quoted the previous public works director that a solution may cost in excess of $10,000,000. This problem has existed for 7 years with only token political stink raised. Given virtually no political cost, and a slush fund that may not come close to funding a permanent solution, the city council has zero incentive to fix the problem. This is what happens when paying customers are captive to a monopoly. As you are aware, the plant has been very stinky for the past five years. We had major issues with the part of the plant processes, installed in 2009, that treat our wastewater solids. We worked closely with the equipment manufacturer and our design engineer for almost four years in an attempt to make the process work. In a nutshell, this treatment process failed and we are faced with processing nearly 7 times the amount of wastewater solids that we are designed to handle. These solids are also not fully “digested” which causes the smells. The City is developing a plan and investigating options to deal with the solids but we have been somewhat painted into a corner. Designing, constructing and operating a new system will be quite expensive and may result in more construction disruption in the neighborhood. We want to be very careful that we make the right choice so that we don’t repeat mistakes. I do understand your frustration…the planning must seem painfully slow. In the mean time, the plant staff is doing everything we can to reduce the smells. Most of the smell comes from the bin room on the west side of the plant (unfortunately, up-wind of you most of the time). When we load the solids into the dumpsters, it stirs up the odors. We try to do the loading as quickly and efficiently as possible and we completely clean out the bin every week before the weekend. We think that has been somewhat helpful. I wish I could tell you we will have a solution in place soon but it may be several years before the smells are gone. Please, don’t hesitate to contact me at any time. There may be something going on that we can fix if the smells get bad. It has been more than a year and a half since I received that email and reading the email response that Chris Bailey sent you, it doesn’t seem they are any closer to a solution now than they were then. Obviously none of the council members live near the treatment plant or the issue would already be resolved. Just last night at about 9:30 or 10:00pm I had to close all my doors and windows in the house because the stench from the treatment plant was worse than dealing with the heat. Instead of worrying about raising rates, the council should be focusing more on a solution to their current problem. For almost 7 years we have had to endure the smell from their so called improvements, we shouldn’t have to pay a higher sewer rate on top of it. resolution of this fix this year. No it’s not, Tom. City staff are not the engineers doing the physical testing and design of the plan to find the plant fixes. That’s what the private sector is hired to do. You see, Albany builds a new plant every 40 years or so. It would be a colossal waste of taxpayers money to keep a staff of construction and biochemical engineers sitting in an office doing nothing but reading professional papers waiting 40 years for the next plat to build. The private sector builds plants around the world, all the time. Government uses the private sector. That should be evident simply because of the fact that all major projects are bid out. City staff’s job is to manage the contracts negotiated with the private sector. In this case Siemens and presumably other companies involved, did not do the job right, in that they could not deliver what was promised. The clear evidence is the settlement already received. People like you always want a laughably simple answer to life. That comes from the ignorance of not understanding the complexity of modern systems, the companies hired to do the work, and the problems to be solved. You also show the ignorance of those that demonize government and government employees because of a fealty to a dogmatic ideology that considers government an evil. All while professing to honor our Constitution – the very thing that created our government. Not being an Albany resident, I don’t have a dog in this fight. But the question that nags me is: since there are thousands of treatment plants all over the U.S. that operate odor-free; why is it so difficult to fix one little plant in Albany, Oregon? Surely there is enough science and enough real-world experience out there to solve this stinking issue in a timely fashion. it will take months—so you see very low expectations. that’s why rate payers are mad as hell.